It is time I wrote your eulogy. Time I gave proper thanks. My goodbye to you was not right – awash with tears and misery and guilt. A man gave you a better send-off; a bucket of feed all to yourself, and you whinnied and danced and were forever blonde. You did not know the significance of the rifle he carried in his arms. You were a racehorse before I met you. “Fractious at the barrier” was one report. I would come to know fractious. “Would do anything for you” was a trainer’s comment. I would come to know that as well. A chestnut with a coat of golden fire and a white star just off centre on your forehead, a white front sock, a velveteen muzzle. Born 8th October 1988 by Spritely Knight out of Khale Gold, in your lineage were StarKingdom, Ajax and Heroic. A sprinter, you raced twenty eight times, winning three and providing connections with eleven excruciating seconds – often less than a length from the prize. I have a blurry photo of you winning by four lengths in Queanbeyan in January 1993. Though I wasn’t there, the image is so familiar – that head, that rump, the way you held your tail. Eventually the money ran out and the trainer’s fees were not paid and you were brought back to a paddock. When I bought that property several years later you were by then a chattel along with your companions. I got my riding confidence back with an old mate of yours – a black rogue named Cisco who would bite me on the bum at any given opportunity. While oiling saddles and bridles I watched you, fed you apples, got to know you, fell in love. The first time I got upon your back you pranced and danced and I thought that you were too much horse for me. However the prancing and dancing was just something I was to get used to. Never a buck. Not once was there malice in your actions. Love returned love. That’s not to say you were an angel, just ask all of your farriers. Remember when we attempted a trail ride with another mob of horses and riders. Everyone oohed and aahed and said what a fine looking animal you were. “Look at that backend”. “Boy, he’s a strong one”. Well you did perform. Head up and down like a rocking horse, prancing to the left and dancing to the right, a sashay in reverse and pirouettes on the spot. Not a foot in the forward direction. You re-arranged my shoulder muscles and re-aligned the bones in my neck. “Race, race, race” was your only thought. If only this were an isolated incident. “Race, race, race”. You were not the only one with these thoughts. How I would have loved to have seen you run. How I would have loved to have ridden you then. Instead we ran our own races. Along a bush track I was overcome with madness. There could have been traffic on that track; not a lot but what a difference a vehicle would have made. The saddle was small and slight not the safe and reliable stock saddle of later years. And I let you rip. Full gallop, full stretch, gravel flying, wind tears frightened from my eyes. Wind tears. Forever they will remind me of you. You tested my patience at times. Five kilometres from home and you were having another fractious turn. Fed-up, I dismounted, tied the reins to a stirrup, told you to bugger off and began walking home. Like a chastened child you stopped your tantrum and stared. Then you joined me, walking alongside, pressing your nose against my back to push me up the hills, nuzzling and loving and utterly well behaved. I still walked five kilometres home. By the time that original property was sold you were no longer a chattel but a beloved family member who joined the big move to another adventure. In the mountainous hills alongside the MoleRiver, you proved useless as a mustering horse. “Race cows not chase cows” seemed to be your motto and the stockhorse looked on in contempt. However at 16 hands and with that huge rear end you were a V8 on the steep hills. You purred. The stockhorse panted. Another move, another property and the years moved on. Time does not halt, horses age, we all age. Horses age quicker. “Rocky Springs” is aptly named. The rocky ground does not lend itself to proper equine burials; just a walk with a bucket of feed and a man with a gun. Just a braid of plaited mane returned. Let this prose then be my goodbye, my thanks. 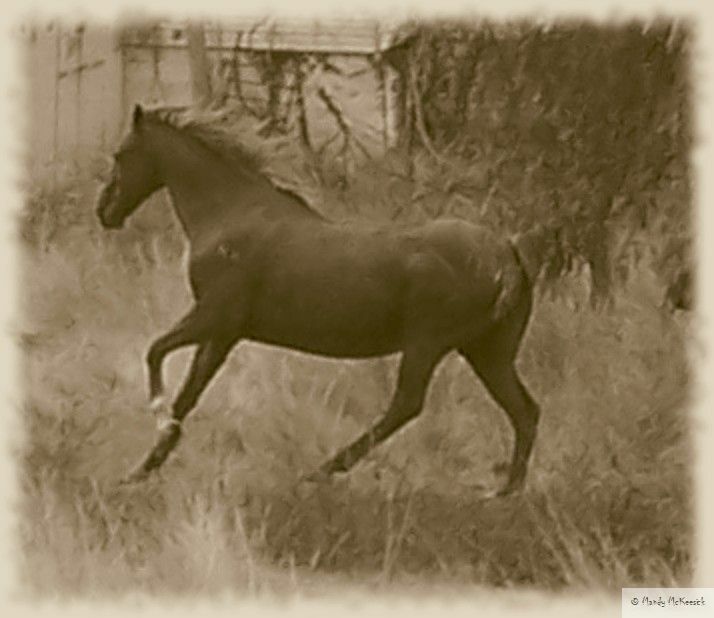 This entry was posted in Equines and tagged death of a horse, eulogy for a horse, grief, letting go, love of a horse. Bookmark the permalink. A lovely tribute to a loved mate. Made me tear up at the end. They say: a tear in the writer, a tear in the reader. Well there was a whole river this end. Beautiful Mandy! I can feel your love for him with your words. Thanks Jill, I still miss the big bloke.